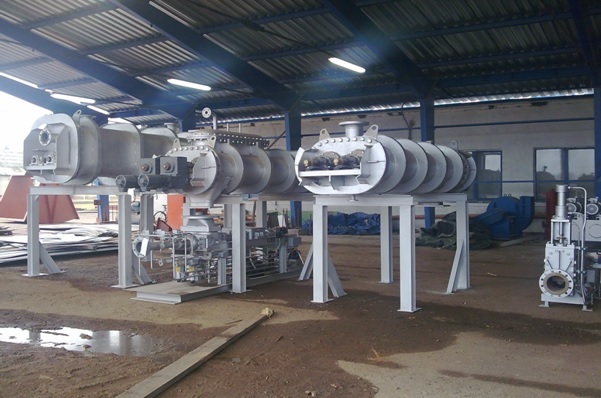 Hydrothermal carbonization (HTC) is a process similar to peat or coal formation. 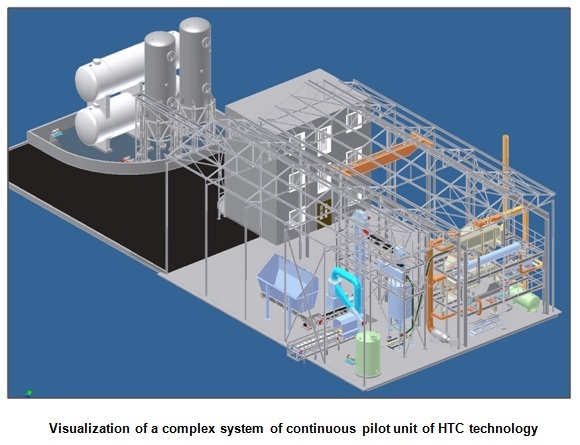 However, while the natural process takes place on the time scale of some hundred (peat) to millions (black coal) of years, and hence cannot be considered in material or bio-energy exploitation routes, the time scale of HTC process is that from hours to day (s). In the process, sugars and carbohydrates (also polysaccharides) are transformed into black soil, peat, brown coal or other carbonaceous materials. Carbohydrates, important constituents of both plants and animals, are polyhydroxy aldehydes or ketones or their derivatives. Compounds classified as carbohydrates range from those consisting of a few carbon atoms to gigantic polymeric molecules. Carbohydrates that cannot be broken down into simpler units by hydrolysis reactions are known as monosaccharides. Examples of monosaccharides are glucose and fructose (both C6H12O6). In the HTC process, carbohydrates in a slightly acidic, aqueous solution are mildly heated (180-205°C) in closed recipients, forming condensed, coal-like structures. A schematic reaction equation is given in Equation 1. Depending on the extent of the reaction, four to five water units per carbohydrate molecule are eliminated in the final product. The elimination of water in presence of water seems counterintuitive, but the reaction is both exothermic in character as well as strongly supported by entropy, due to increase of numbers of molecules and degrees of freedom. For complex biomass, the chemical decomposition cascade of GTC is more complex than for pure glucose. Model examination with glucose and GC-MS examinations of the intermediary states of biomass indicate that main reaction channel of HTC is a very quick partial dehydration of the carbohydrate to hydroxymethylfurfural. The hydroxymethylfurfural subsequently undergoes cycloaddition and polymerization reactions, essentially resulting in structures rich in carbonyl, aliphatic and aromatic hydroxy groups. As mentioned above, four to five water units per saccharide unit are eliminated in the process, depending on the extent of reaction. Once activated, the HTC process is a spontaneous, exothermic process. Thereupon of the high thermodynamic stability of water, it liberates about a third of combustion energy stored in carbohydrate. The carbon efficiency (CE) of HTC is close 100 % for pure dehydration, i.e. practically all of the starting carbon stays bound in the final carbonaceous material. For this value, temperatures below 200°C and pH value between 5-7, are mandatory. The CEs of fermentation and anaerobic digestion are 66 % and 50 % respectively. HTC generates its own energy.